Los Angeles County Supervisor Mark Ridley-Thomas joined faith and community leaders this week at West Angeles Church in South Los Angeles to announce major endorsements for Controller Wendy Greuel in her effort to become the first woman mayor of Los Angeles. Ridley-Thomas, civil rights icon John Mack, Sentinel Publisher Danny J. Bakewell Sr. faith, business and community leaders representing the widest spectrum of Los Angeles and the Black community assembled and announced their uniformed personal support for Wendy Greuel for mayor. Also joining Greuel was Bishop Charles E. Blake, presiding bishop and chief apostle of the Church of God in Christ and pastor of the West Angeles Church of God in Christ, Kenneth C. Ulmer, senior pastor-teacher of Faithful Central Bible Church, and Reverend Dr. Cecil “Chip” Murray, former pastor of the First African Methodist Episcopal Church. At the event, Greuel joined with community and business leaders to unveil her ideas for creating jobs in South Los Angeles by reinvesting former Community Redevelopment funds into the community; stabilizing and expanding existing businesses, and creating a link between job development and job training. The assembled leaders described the mayoral candidate as an “honest, accountable leader” whose commitment to the African-American community runs deep back to her time working for Mayor Tom Bradley and with the Department of Housing and Urban Development in President Bill Clinton’s administration. President Clinton has also endorsed Greuel for mayor. Greuel has worked to secure support from across the African-American community from faith, business, and community leaders, civic activists and elected officials. “I have become convinced that the candidate best able to lead all of Los Angeles during this troubled time is City Controller Wendy Greuel. I have known Wendy for over 25 years. I have confidence in Wendy Greuel. She is a committed problem solver, whose knowledge of city government, experience, and appeal to all segments of our city equips her to lead,” said Ridley-Thomas. "Wendy Greuel has worked tirelessly to understand and respond to issues confronting so many different communities that make up Los Angeles, and has joined with them in celebrating their diversity," said Mack. "I've known Wendy since her days working for Mayor Tom Bradley where she helped start innovative childcare and after school programs, and worked to create affordable housing and economic development projects throughout Los Angeles. As President of the Urban League, I have worked closely with Wendy to ensure all of our diverse neighborhoods and schools are safe and secure from gangs, guns and drugs, and are policed with respect. 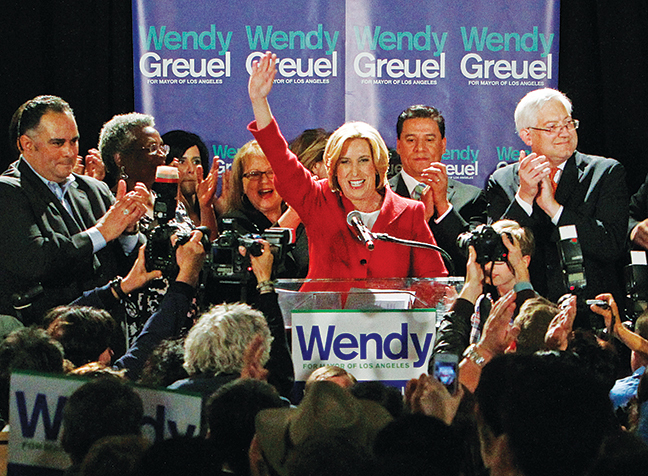 Wendy Greuel will be an outstanding mayor. I know that she'll fight to rebuild our economy and create jobs, especially more jobs for underserved communities. I am proud to support her and serve as part of her leadership team so that we can build a better Los Angeles for the future." “Wendy has demonstrated a zealous and continuous commitment to the Black community as well as the City of Los Angeles,” said Bakewell. SEIU United Long Term Care Workers (ULTCW) joined its sister local, SEIU 721, in announcing its endorsement for Wendy Greuel for L.A. City mayor. SEIU ULTCW represents 180,000 long term care workers (home care providers and nursing home workers) throughout the state. Of its membership, over 60,000 live in the city of Los Angeles and provide essential care to approximately 72,000 low-income seniors and people with disabilities. "Wendy Greuel understands the needs of our communities and will be a true champion for working families," said Laphonza Butler, president of SEIU United Long Term Care Workers (ULTCW). "As Mayor, Wendy's experience and history of success as a proven leader will benefit all who call Los Angeles home." An organization comprised largely of working mothers, the members of SEIU ULTCW relate to Greuel as a working mother herself, and share in Greuel’s commitment to creating good jobs, ensuring a quality education for all children, increasing public transportation, fighting on behalf of immigrant rights, and protecting the services our seniors and people with disabilities rely on to live as independently as possible at home. "I know she'll be a fighter for communities across the entire city," said Adrian Dove, chairman of the Kingdom Day Parade and California Congress of Racial Equality (CORE). "Wendy and I share a commitment to social justice, and whether it was advocating for affordable housing when she worked with Mayor Tom Bradley, or fighting to make our schools better and our streets safer as Councilwoman and Controller, Wendy has dedicated her career to giving every single person in LA a chance to succeed. I am so proud to endorse her for mayor." Wendy has a strong base of support in the African-American community, including endorsements by Ulmer, Reverend Dr. Cecil “Chip” Murray, Olympic Gold Medalist Rafer Johnson, Public Safety Leader and Police Reformer John Mack, and the Black Los Angeles Young Democrats. Greuel has brought together a strong coalition of support from public safety workers, major business groups, and labor organizations, including the Los Angeles Police Protective League, the United Firefighters of Los Angeles City, the Association for Los Angeles Deputy Sheriffs (ALADS), the Professional Peace Officers Association (PPOA), the Valley Industry and Commerce Association (VICA) PAC, the Los Angeles Area Chamber of Commerce's LA JOBS PAC, the County Federation of Labor (BizFed), and over 20 labor organizations representing tens of thousands of working men and women across Los Angeles. Greuel is also endorsed by the Los Angeles News Group (which owns the LA Daily News), the Planned Parenthood Advocacy Project, and the Association of Independent Commercial Producers (AICP).